I would like to introduce you to The Island. 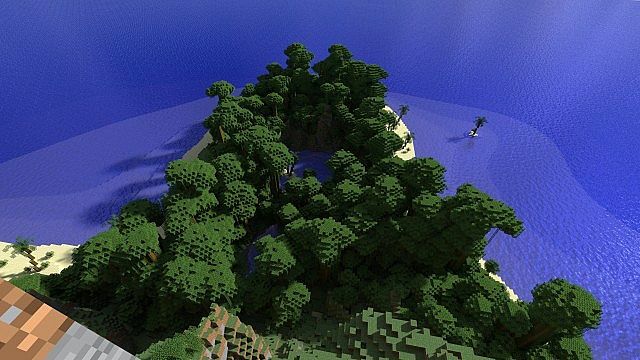 This Island was purely built on McEdit and Minecraft itself. World Edit and World Painter were not released at the time. Let me know what you think, criticism is welcome. Beach is lovely at night. The "key" opens the doorway. Thank you! I don't mind at all, pretty cool animation. Gave it a like! Haha, i found a stair case leading from my house down to a torch, did you place this in? Hm, I don't think I know anything about a torch. I do however know something that a lot of you may have missed. I actually checked today if everything still works in 1.8 and it did. If you haven't already found a way in to the temple (without cheating of course), I suggest you keep looking. OH and I heard the beach is lovely at night. 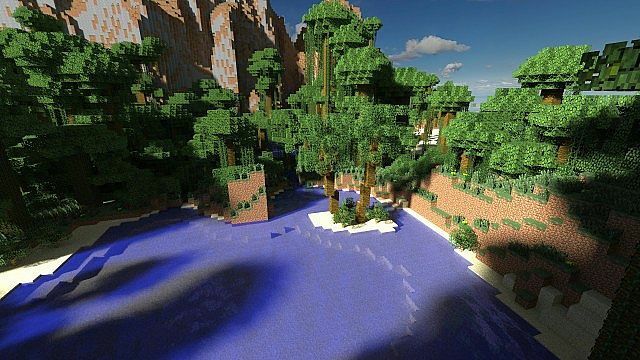 haha i hate the jungle, makes my computer lag, like a lot. So i live in the moutain. 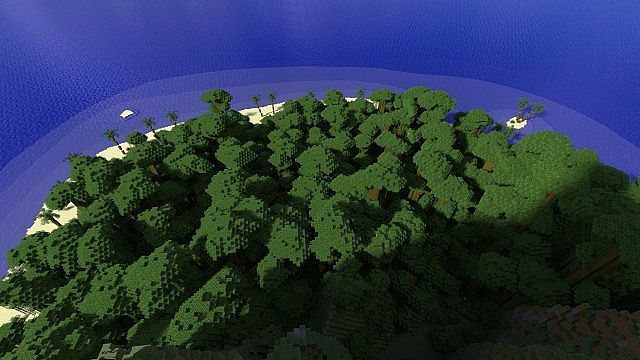 I can see everything, im planning on making the map into a paradise, but im going to do it in survival mode. Well, i found the tunnel connected to a massive iron, resource it goes down as a stair case, then it reaches a section where you can pick the dirrection to go, but there is a torch at the bottom, so i go up and theres that hole in the side of the mountain with a chest and a fire, but going just goes out the entrance at the bottom, was there meant to be something in the chest at all? I"ma camp out on beach. Since you mentioned that Temple, ive been looking for it forever, i have a feeling its underground. Cause ive searched the whole island. I believe you have an old version of the map. Cause what you are explaining was the first version I released with a test for puzzle stuff. So you will have to download the latest save for a larger adventure/puzzle. Sad part is you will have to rebuild everything, but it's more balanced for survival as well, a lot of improvments to the Island in general. 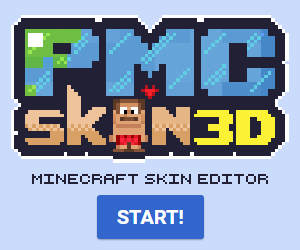 So I would definitely recommend downloading the latest version. Yes i do have the new version, of it but i try to avoid the jungle. 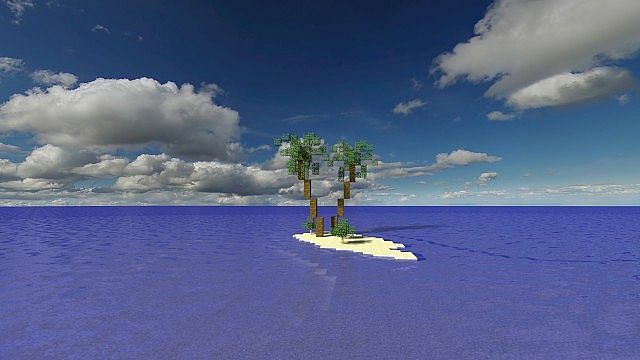 I'll probaly upload this as a save for minecraft when i finish the paradise island. Ill make sure your included in the credits. Or i could export the file over the one that i have now meaning it would just copy over. Are you sure about that? Cause the massive iron "cave" was a long time ago. Jesus, this is awesome. May sound weird but, It actually reminded me a lot of Banjo Kazooie for some reason. Great work. I never actually played Banjo kazooie that much so I wouldn't be able to spot any resemblance. That is a very lovely island! I would love to survive there even IRL. If I could, I would do that as well. This is a great map! I have made a perfect fort on the side of mountains! I would love to see that fort. I will remake it the best I can and take the screenshot! You definitely should, I'm a bit curious now. In the background i saw the farlands. so its been about a month... hows the map goin? UberHaxorNova Played this...A guy boke a rule.. that is colouring wool. then he has a made rampage. The video name is WOOL he had keyboard rampage. That's funny! when I saw this map and the palm trees, the first thing I thought of was WOOL. I don't know but,is there a volcano? Found the main island treasure, can't find the other island treasure, checked in mcedit and it isn't even there? Can you explain this? Simple, me and my friend were creating a village/lookout point on top of the tallest mountain, he decided to make a shortcut thruu the mountain by digging thruu it from the top to the bottom, i go with him and we fall thruu into this huge cavern with ores and stuff, anyway later on i was messing around in the underground lake and found a underwater path to another cavern, messed around in there and found the chest. That's how i found it, i like where you put it and how hidden you made it. 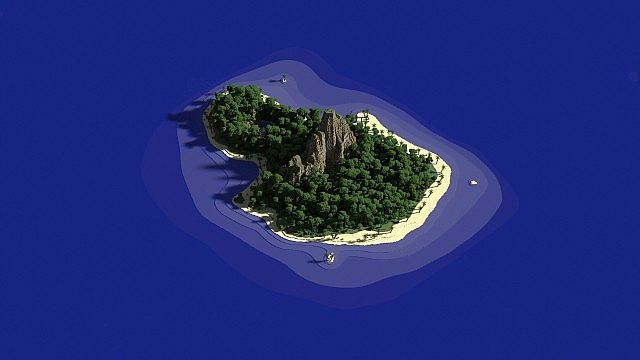 I also like the whole island in general, and the other two islands, best map ive seen for minecraft. Thank you for that, I really enjoyed reading that. I'm currently thinking of changing the ores in the tube to like coal or something. Just to make it harder to survive. I mean it's kind of easy to just find the tube thing and then have like 100+ diamonds/gold/iron. I've been back and forward on the rules. It would be fun if you won't be able to destroy any blocks in the mountain until you find the hidden chest with the map. I've also been trying to do something cool with the map so when you find the map, you suddenly find a place on the world where the treasure may be. And then start a big adventure thing. But that's probably for the future. 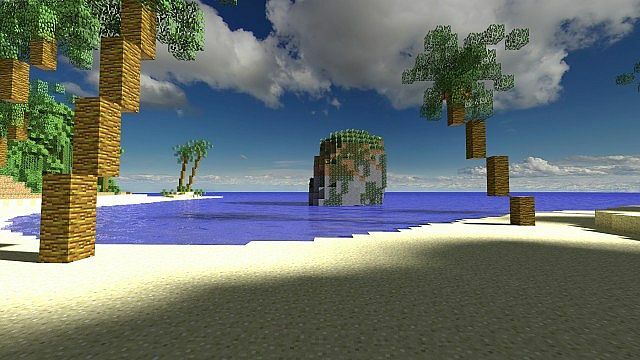 That's fine, but i spent hours looking for the treasure, ill just place my own treasure on the islands so my friends dont go on a fools gold hunt. 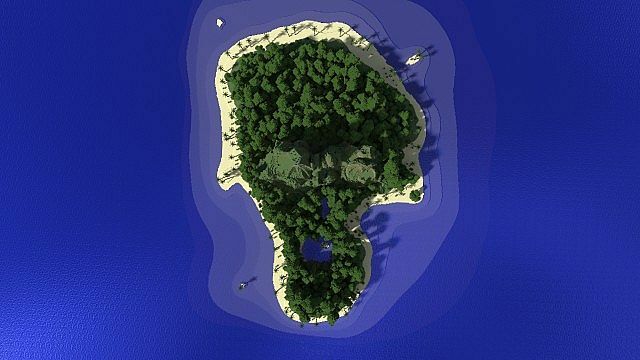 Maybe add a sunken pirate ship with treasure on it or a hidden treasure cove? Also more islands, those are what i think could improve it. A sunken pirate ship is a great idea, but I need to wait for Notch to increase the height limit for that. Don't worry about more islands, there are a lot of islands on the way! I don't know if you saw the first place I placed the chest. But it was buried at the beach, I thought that was too easy to find, so I made it harder. But I hope it's not that hard to find it. This looks great! a schematic of this would be widely appreciated! Add a large tree in the middle of the main islands. I think there already is one. Perhaps not in the released version. I actually don't know if it is. Oh.........my.........god.........if you make 5 islands, we'll have the Cinco Muertes, the Five Deaths, Jurassic Park time! I'm actually already doing that, it was just temporarily. But it's going to be waterfalls/cliffs/mountain/dam etc around this. Hello, how did you create your mountains? I used TrynePlague's method to do the mountain, then I made the surrounding by my self. Just search his name on youtube and you'll find it. This is amazing! however, i can sorta see other land in the backround. still, Thumbs up! Keep in mind, this isn't a finished project. Hows the fourth island going? Can't wait! I will check the link later tonight when I come home. Edit: I couldn't find any problem with the download link, but I re uploaded it. Hope this will help. If so, I'd make another island and make that island the "main" island, instead of increasing the height of the other island. But I sure hope Notch increase the height limit to 500 something. Would be awesome! Looks Amazing! Can't wait to start playing! whqt stupid tard flagged this there is Absolutely nothing wrong with it its amazing! It's actually not a treasure, it's a volcanic tube. Or it rather looks like it.